For those not following the saga, basically my 86 Wagovan is having... issues. Issue 1 is an apparent fuel starvation issue when at sustained high throttle (long on-ramps, etc). Issue 2 developed after altering the timing, the engine runs rough at idle, with a little bit of a hunting idle, and wants to be way leaner than before. It appears to be running very rich, but the weirdness will come and go. In an attempt to address Issue 1, I’ve already changed the fuel filter, fuel pump, fuel lines, fuel 1-way valve, coil, cap, rotor, spark plugs, HT leads wires, and adjusted the valves and carburetor float. Mostly basic tune up stuff and it did make the problem go away... for a time. I had not, however, checked the fuel pressure and the fuel flow, because I didn’t want to. That was last night’s task. Long story short (too late), the fuel pressure was pretty much perfect, hovering right around 2.9 psi (spec is 3.0). Pressure with the fuel return capped was well above the minimum of 2.7 psi, running right at 4.1 or so. Fuel flow needed to be a minimum of 5.7 fl oz in 60 seconds and I hit that in 20 seconds. The positive is that I didn’t find anything wrong. The negative is I didn’t find anything wrong. With that, I don’t really have anything left aside from assuming that Issue 2 and issue 1 are related. Or at the very least I’m not going to continue chasing Issue 1 until Issue 2 is resolved.... probably. Wouldn’t be a bad band name. Anyway, my strategy here was to just poke at stuff and see what I could see. I’d developed a theory earlier in the day that I might have a fuel leak into the carb, which would explain the cars sudden dislike of gasoline. Sure enough, when I popped the air cleaner off there was some staining on the gasket, indicating a fuel leak. I could also see evidence in the carb throat that fuel had been leaking. I re-torqued the screws and did not see any further indication of a leak as I proceeded with troubleshooting. Next up I checked the manifold vacuum as some people had suggested doing. Vacuum looked pretty excellent, holding super steady right at 20 inHg. I did some playing with the idle and mix screws to see if I could get that number up a little, but the best I could get is about 22 inHg. Apparently my tuning by ear is pretty ok. 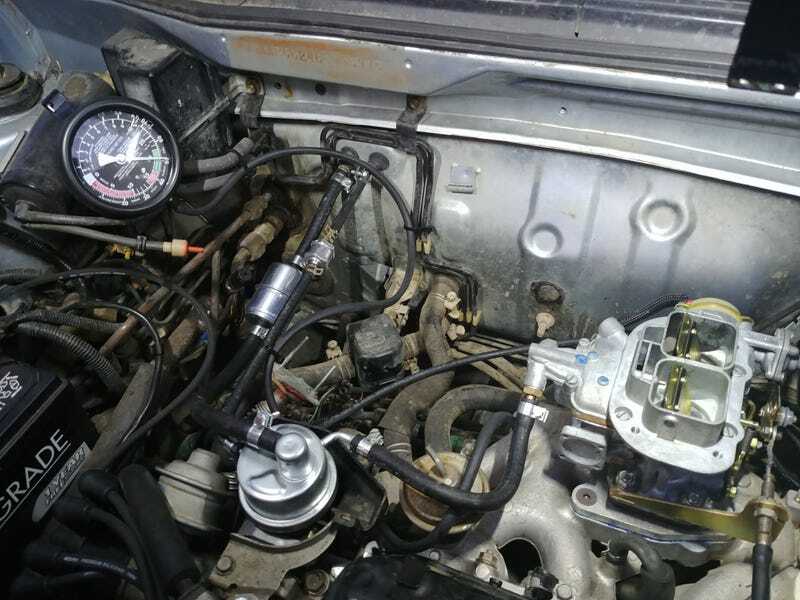 The biggest takeaway from this was the ignition problem seemed to be intermittent, with the car running fine for a little bit, then like crap, then fine, with no real pattern. Also it seemed to hate fuel. Even a hint of carb cleaner and it would bog down or die. If I opened the throttle very slightly, enough to trigger the accelerator pump but not an appreciable throttle opening, the added fuel would bog the engine way down and make it sound like it was missing. The fact that this all started when I moved the distributor makes me suspect a wiring or ignition issue. This suspension is strengthened by the problem seemingly getting worse when it manipulate the ignitor wires on the back of the distributor. The wires look OK, but covered in oil and grit. I plan on inspecting them when the replacement parts come in. NOTE: The radio condenser is intended to reduce ignition noise; however, condenser failure may cause the engine to stop running. What symptoms point to a bad condenser? My 29, which has a new distributor with modern points, acted up something terrible lat night on a 50 mile run. It started with a random miss at 45 mph, and within 15 miles, we were limping along in first gear, bucking and powerless, with an occasional backfire out the carb. People had a lot of suggestions, most of which are irrelevant because I don’t have points, but there was a consensus that the condenser could cause those problems. So... what if my fuel starvation issues aren’t fuel starvation, but actually something in the ignition system getting hot and deciding it is over it? Or maybe I have dirty/ corroded contacts on my ignitor and messing with it while playing with the timing shorted something out? This small glimmer of hope is almost certainly false hope, but it is all I’ve got so I’m rolling with it. New parts will be here next week and in the interim I’ve got some plastidipping to do!